Home > Shop By Brand > McKee's 37 Marine & RV > McKee's 37 Marine & RV Carnauba Wash & Wax 128 oz. McKee's 37 Marine & RV Carnauba Wash & Wax 128 oz. McKee's 37 Marine & RV Carnauba Wash & Wax produces a thick, rich lather to remove the dirt, grime, and bugs that end up on your boat or RV. This pH-balanced, environmentally-friendly formula forgoes the harsh detergents and butyl alcohols to ensure the best clean possible without risk of damaging gelcoat, clear coat, painted, chrome. or other surfaces. McKee's 37 Marine & RV Carnauba Wash & Wax not only cleans without leaving water spots behind, it also deposits gloss boosting carnauba in its wake, making it the perfect choice for your boat or RV! Not all boat and RV soaps are created equal – McKee's 37 Marine & RV Carnauba Wash & Wax is proof.There are dozens upon dozens of boat and RV soaps available, but the common trait they all share is harsh, alkaline-based cleaners that strip your wax coating, leaving your boat and RV bare and unprotected. That's not the case with Carnauba Wash & Wax. Our unique, high-foaming formula is pH-balanced and 100% biodegradable. Not only does it preserve your existing wax coating, it reinforces it with real carnauba wax protection! McKee's 37 Marine & RV Carnauba Wash & Wax is a great value, too! Just 2-3 ounces of this concentrated formula is all you need to blanket your boat or RV with frothy foam. And don't worry about water spots, because you're not going to have them! It's water not soap that causes water spots. Simply wash the entire boat or RV with McKee's 37 Marine & RV Carnauba Wash & Wax coating it in its entirety with soap and then rinse the entire thing at once. Dry with a Turbo Marine/RV Dryer or soft chamois. McKee's 37 Marine & RV Carnauba Wash & Wax was formulated to be completely user-friendly. We took into consideration the fact that your boat or RV could potentially be MUCH bigger than your vehicle, making finding a shady spot to wash it in nearly to impossible. Our sun-friendly formula rinses clean without streaks, haze, cloudiness, or water spots even the used in direct sunlight! The real carnauba wax in the McKee's 37 Marine & RV Carnauba Wash & Wax formula boosts gloss and protection with each application. McKee's 37 Marine & RV Carnauba Wash & Wax uses a sun-safe formula that rinses clean of streaks, haze, and cloudiness! 1. Add 2-3 ounces of solution to your wash bucket. 2. Activate foam using a strong jet of water. 3. Wash the ENTIRE boat or RV before rinsing 4. 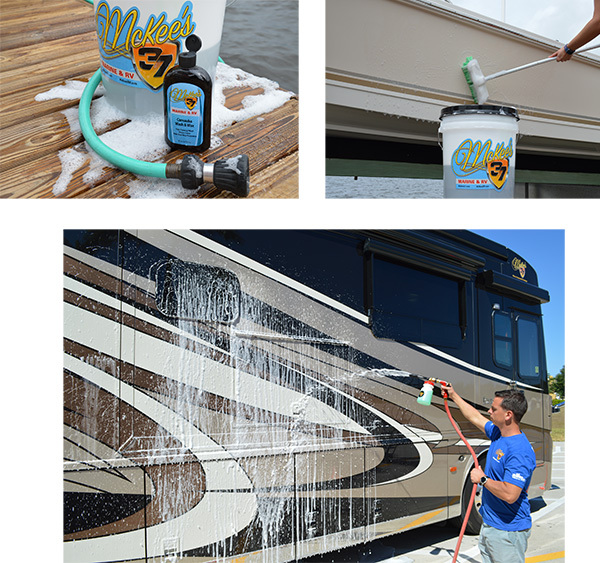 After you're finished washing, rinse clean and immediately follow using McKee's 37 Hydro Blue for Marine/RV. 5. Dry the surface using a Turbo Marine/RV Dryer or soft chamois. McKee's 37 Marine & RV Mildew RemoverMcKee’s 37 Marine & RV Mildew Protectant SprayMcKee’s 37 Marine & RV Water-Resistant Vinyl ProtectantMcKee’s 37 Marine & RV Gloss Enhancing Final PolishMcKee's 37 Marine & RV Hydro Pearl Sio2 CoatingMcKee's 37 Marine & RV Final Step Detail WaxMcKee's 37 Marine & RV All-In-One Fabric & Vinyl CleanerMcKee's 37 Marine & RV Carnauba Wash & WaxMcKee’s 37 Marine & RV Heavy Duty Cleaner WaxMcKee’s 37 Marine & RV Repel Glass & Plastic CleanerMcKee’s 37 Marine & RV All Purpose Surface CleanerMcKee’s 37 Marine & RV Bug Remover & Wax RestorerMcKee’s 37 Marine & RV Vinyl Decal & Graphic RestorerMcKee’s 37 Marine & RV Heavy Cut Oxidation RemoverMcKee’s 37 Marine & RV Carnauba Sealant WaxMcKee’s 37 Marine & RV One-Step Polish & SealantMcKee’s 37 Marine & RV Repel Glass & Plastic Cleaner 128 oz.McKee's 37 Marine & RV Final Step Detail Wax 128 oz.McKee's 37 Marine & RV All Purpose Surface CleanerMcKee’s 37 Marine & RV Bug Remover & Wax Restorer 128 oz.